Summer House 203A-Beach Front Views from Huge Terrace! Delight in your own little slice of paradise when you visit the Summer House Resort in beautiful Orange Beach, Alabama! This beachfront destination boasts a myriad of amazing amenities for everyone to enjoy, and paired with its ideal location amidst the pristine shores of the Alabama Gulf Coast, you’re sure to call this incredible resort your new home away from home! This 3 bedroom, 2 bath retreat embodies contemporary comfort and elegance, where crisp, calming neutrals and nautical accents form a tranquil spa-inspired ambiance. The living area boasts plush furnishings in soft neutrals, giving the space a sophisticated yet updated feel, while ample seating allows the whole family to lounge and enjoy a cozy night in watching movies on the giant flat screen HDTV! Perhaps the best feature of the living room, the floor to ceiling glass doors open directly to the expansive Gulf front terrace. You’ll be greeted by the soft sea breeze and immediately transported into a state of sheer serenity when you sit and delight in the splendor of the Gulf’s perfection. Shimmering sugar white sands and emerald turquoise waters mingle and meet, eventually evolving into an endless awe-inspiring horizon. Savor your morning coffee or even dine al fresco while enjoying the sweeping views of one of the world’s most beautiful and wondrous landscapes. The gourmet kitchen will please even the most discerning chef, featuring granite countertops, custom tiled backsplash, a floating island, custom cabinetry, new appliances including a side by side fridge with filtered water and ice dispenser, plus all the cookware, dishware, utensils and small appliances needed to prepare a culinary masterpiece. A corner breakfast bar offers seating for 2, and the handcrafted wooden dining table is a work of art itself, with high back chairs affords seating for 6. The master retreat is an oasis in itself, offering a regal king platform bed with premium mattress, high thread count linens, and plush bedding. More floor to ceiling glass doors access the beachfront balcony, so you can wake up and enjoy the stunning vistas only a few steps from bed! The second bedroom boasts two queen beds with deluxe bedding, fine linens and top of the line mattresses, and the third bedroom offers another queen with premium bedding and mattress set. Each bedroom offers a flat screen television and ample drawer and closet space. The living room sofa can be converted into a queen sleeper, accomodating 10 throughout. In addition, you'll receive the service of a local liason available to ensure you a worry-free stay. Luxury Coastal Vacations offers the friendliest staff, and timely responses to guest needs. Assistance is available 7 days a week, and 24 hours for any emergency issues that might arise! Don't spend your next vacation dreaming of the perfect getaway, stay at the Summer House Resort and finally experience it! Perfect beach spot for our family of 6! The condo was stocked well with lots of little extras like: plastic storage bowls, a big pot for a shrimp boil, lots of towels, blankets & pillows. I would highly recommend this gem! We’ll be back for sure! Thank you Tammy! It sounds like you all had a wonderful family vacation and we are ecstatic that we were apart of it! We can't wait to host you again! The unit itself is very nice. Though it is 1300 sq ft, it is extremely well set up. It is very updated, has new appliances in the kitchen, excellent full size washer/dryer. One of the best stocked kitchens we have had. The unit was just about spotless, very well cleaned. If we plan another off summer trip, we will definitely return here. Thank you again for staying with us! We're thrilled to hear that you were happy with this amazing condo! We'll be sure pass your feedback about the chairs along to the owner right away. Please let us know when you'll be headed our way again- we'd love to have you back! We loved the unit except for an awful smell that we never could determine where it was coming from. We had maintenance come in twice but they couldn't locate the source either. It is in the washer/dryer and/or kitchen area. We loved our stay otherwise but you may want to determine what is causing the smell. Thanks. Thank you for taking the time to share your rental experience with us! We're so glad to hear you were pleased with the unit and enjoyed your stay overall. Our apologies about the smell that you encountered during your stay. Our Operations Team has thoroughly inspected the entire condo but fortunately it seems to have resolved itself. The guests who've stayed in the condo since your rental have not experienced this either, so everything seems to be back to normal :) We'd love to have you stay with us again, so please keep us in mind for your next trip to beautiful Orange Beach, Alabama! This was our first trip to Orange Beach and the beach and condo did not disappoint. 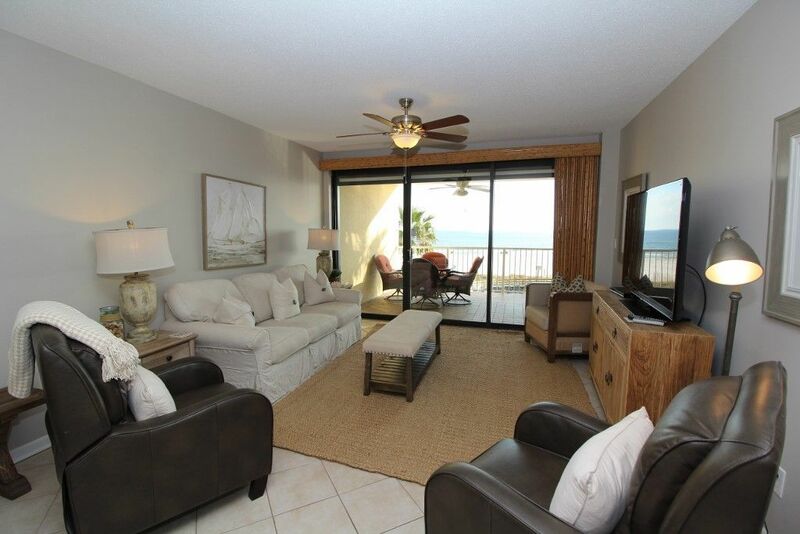 The condo is conveniently located on the second floor near the beach ramp and overlooks the pool. The amenities in the condo were nice and we found that there was nothing lacking for cooking. A word of advice, and not anything that the owner or rental company can help with, the gnats are pretty bad around the property so be prepared! And not sure if I missed it somewhere when booking but each condo is only allowed 2 parking spaces. Security does monitor and they will tow! But nice to know the Summerhouse has overflow parking right across the straight if you go in and talk to the manager! Overall a great stay - would definitely consider returning. Thank you for your positive feedback! We are happy knowing that you enjoyed your first trip to Orange Beach and the condo you rented. Thank you for letting us know about gnats, it does happen around this time of year, but hopefully they did not ruin your trip. As of the extra parking, its wonderful hearing that the office was able to help you find a spot. We do hope that we see you again in the future. We really enjoyed our week in Summerhouse. It is so close to everything, and the condo was very clean. The fact that we could use the stairs and walk right out to the beach was a plus. Thank you for choosing to be our guest and providing us with your wonderful feedback. We are so happy to hear you enjoyed your stay with us. We hope to have you join us again in the near future! Excellent location and really pretty condo. Wonderful balcony and view; very comfortable furniture and beds. Thank you for your feedback. We are happy to know that you enjoyed your vacation and the condo. We hope that we will see you again soon!